미국 라쿠텐이 모든 상품에 대해 최소 20%에서 최대 30%까지 리워드를 하고 있다. 카테고리에 따라서 다른 것으로 보이며, 신발은 30%가, 컴퓨터 부품은 20%가 적용되고있다. 리워드로 받은 슈퍼포인트는 발송되면 적립되며, 적립 후 1년 이내에 사용하면 된다. 얼마전부터 장바구니에 넣어 두었던 신발이 가격은 같은데, 30% 리워드가 적용되서 49.99달러짜리에 1470포인트(14.70달러)를 리워드로 받을 수 있다. *This Rakuten Super Points™ promotion will begin on 7/15/18 at 12:00AM PT and ends on 7/15/18 at 11:59PM PT. 20% Back is awarded in the form of Rakuten Super Points™. This promotion requires customers to establish a Rakuten.com account or signed into their Rakuten.com account and complete the checkout process by 11:59PM PT on 7/15/18. Rakuten Super Points™ are viewable at checkout. All Rakuten Super Points™ earned during this promotion will be available once the order has shipped and will expire 1 year (365 days) thereafter. For exact Rakuten Super Points™ expiration dates, please check your Rakuten.com Account. Rakuten.com reserves the right to void Rakuten Super Points™ on orders that do not follow these regulations. Bulk purchases made by resellers do not qualify.Rakuten Super Points™ are not cash or currency and cannot be transferred, credited to an account, redeemed for cash, or used for gift card purchases or redemptions. 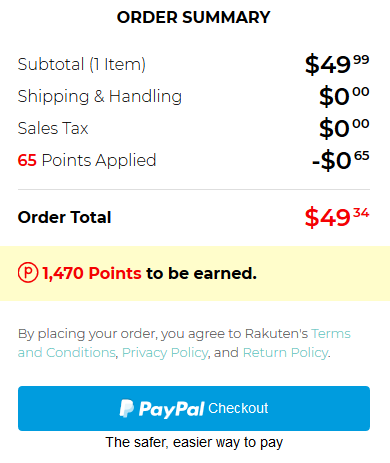 Rakuten Super Points™ may be earned on the amount of your order, excluding taxes, shipping and any coupons. This promotion cannot be combined with any other cash back reward program. Rakuten.com reserves the right to end this promotion at any time.